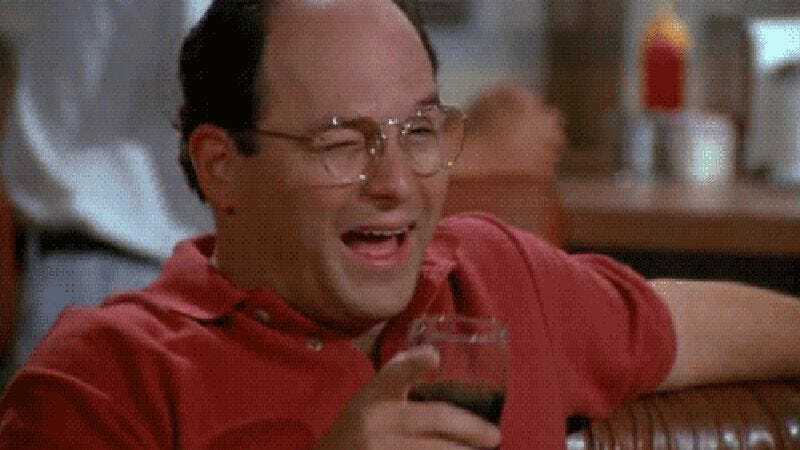 Let the jokes about pretzel-inspired thirst commence: According to Uproxx, Australians will be wetting their whistles and doing their best impressions of “The Lord Of The Idiots” at a new George Costanza-themed bar. The somewhat unimaginatively-named George’s Bar in Melbourne is now serving Costanza-inspired cocktails such as “The Summer Of George” (naturally) and “The Marisa Tomei,” which is a piña colada drink for some reason. Although the heir to Frank and Estelle’s fortune (all those TV Guides are probably worth something) spent far more time in a coffee shop than any saloon, co-owner Dave Barett believes the erstwhile Koko’s personality “suits a bar in a lot of ways,” and that there’s a lot of humor to be found in the character’s almost unrelenting hard luck (no argument there). The bar also features toasted sandwiches, including “The Costanza,” which we hope is not served mid-coitus. Sadly, “Draped In Velvet” has been relegated to the cocktail menu, as the decor is mostly made up of signage and decals. But the character’s bespectacled mug is plastered through the establishment, thereby fulfilling his desire to have his likeness hung from walls (like Lenin), where it can be adored by, in this case, boisterous barflies. George’s Bar opened over New Year’s Eve, and already has Costanza portrayer Jason Alexander’s support; the actor tweeted about his boozy namesake, which has helped offset disappointment over his lack of an Emmy. Here’s hoping a jerk store opens somewhere soon, where the character can be master of his domain.